I’m sure you have all heard of Zoe Sugg and if you haven’t you must be living under a rock. Zoe aka Zoella is a Blogger, Youtube star and an all round inspiring woman. Zoe is a 24 year old young woman from England who started her blog in 2009 and with a Youtube channel boasting now over 7 million subscribers and a recently launched beauty line, she has only grown from success to success. Talking everything from beauty and fashion to lifestyle and life issues Zoe has captured the hearts of many people with her lovable personality. When I heard that she was writing a book ‘Girl Online’ which is one of her dreams I knew that I just had to read it and that I would must likely love it as much as I love her. The first thing I notice about a book is it’s cover. 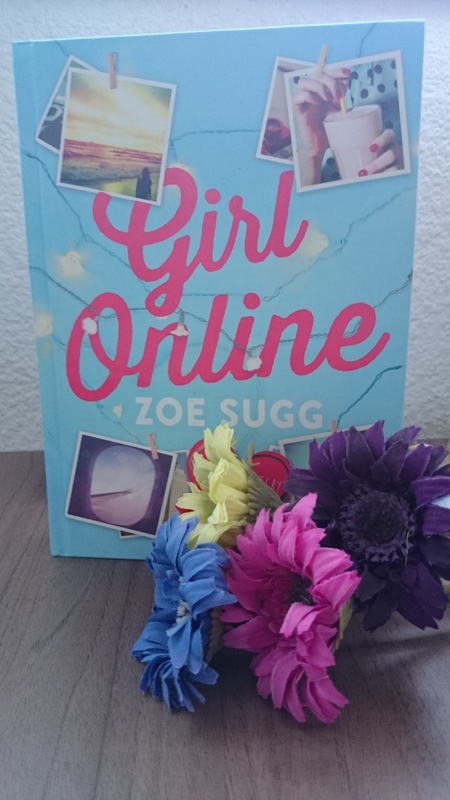 I know you shouldn’t judge a book by its cover but its certainly does draw your attention whether we think about it or not and ‘Girl Online’ certainly has a cover that draws the eye. The baby blue colour with fairy lights and little Instagram photos pegged up just looks so cute and makes me automatically think of Zoe if that makes sense. So this was an automatic bonus for the book. When you get into the book, it is a very well written and enjoyable story. The book follows Penny who is a ordinary teenage girl who decides to write a blog under the name Girl Online as a place where she can write her thoughts down about her life. Her blog is anonymous with only her very best friend Elliot knowing its her. From friendships to boys and love to anxiety ,Penny writes down her thoughts receiving quite a following as people relate to all her problems. When her parents get a chance to plan a wedding in New York it means the start of something new for Penny, not only will she be facing her fears of anxiety with the plane ride and going to a new city but it is in New York that she will meet Noah. Noah , someone who Penny sees herself falling in love with as he accepts her for who she is flaws and all, and we see the story unfold between them as the story goes on and learn the secret that Noah has to keep. I really enjoyed this book as not only does it show us young love and teenage life it also deals with deeper issues notably anxiety with which Zoe herself suffers and is very passionate about raising awareness of. Through Penny we are given some information about how anxiety affects people and the book helps to raise awareness and show people they are not alone. Along with this the book also deals with issues surrounding the internet and how you can still hurt people from your words on a screen. Along with these issues we see Penny dealing with growing up and friendships. It is a well written book that is very easy to ready but that also deals with many issues relevant to many people. I would definitely recommend to anyone to read this book young or old as it is extremely enjoyable and also makes you think. Let me know what you thought if you have read it….